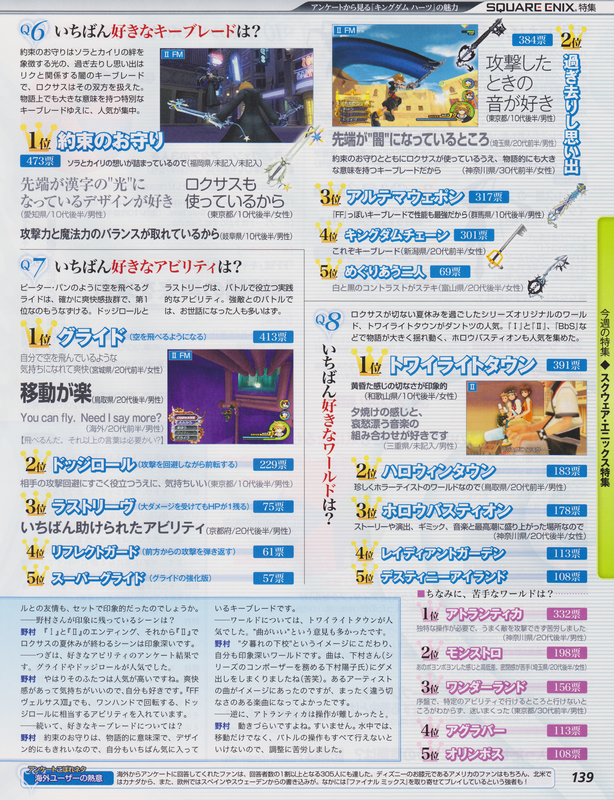 SQEX-GAL has published magazine scans of the most recent issue of Famitsu Weekly, featuring a new interview with Tetsuya Nomura revealing new details on Kingdom Hearts 3D. In addition, the interview has now been fully translated. Since I hear a lot of opinions that fans really like one particularly, I’m surprised to see that KH2 Final Mix ranked number one and then KH2 ranked after it. I didn’t want Birth by Sleep to seem like a spin off, so I’m happy to see it ranked in the top five. 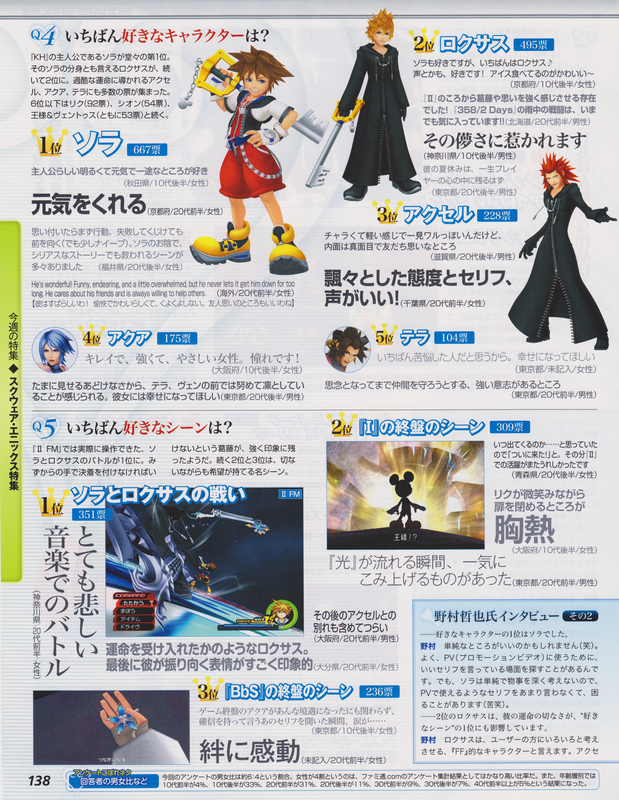 My favorite character Sora must be ranked number one since he’s an uncomplicated, good guy. He gives us trouble though; when we make the promotional trailers it’s hard to find lines of his we can use since he doesn’t really say much useful. The second ranked character Roxas, fans think he’s the most Final Fantasy-esque. Along with his friendship with Axel, they make an impressive set. The most impressionable scenes for me were the endings of KH1 and KH2, and the scene in KH2 when Roxas’ summer vacation ends. My favorite abilities are the popular Glide and Dodge Roll as well. They have a reinvigorating feel and are comfortable to do, so I like them. Along the same line, we’re including a one-handed rotation ability similar to Dodge Roll in FF Versus 13 too. My favorite Keyblade is the top ranked Oathkeeper. It carries a deep meaning with the story and the design of it is clean, it’s the one I’m most pleased with. With the most popular world, Twilight Town, we really fussed over embodying the image of coming from school as the sun sets. That song gave Shimomura-san a lot of trouble and pushed her to improve. We had an image derived around another artist’s song, but it really worked out well, the result was a song with a completely different sort of anguish. The worst world to deal with was Atlantica, sorry it was so difficult to move. We had trouble adjusting the character’s movement while swimming and simultaneously fighting. The popular enemies like the Shadows, Neo Shadows, White Mushrooms, Dusks and so on; I drew them myself. The enemies dictate the overall design aspects of the series, so I work them out with the staff afterwards. The hardest enemy for me was the Dancer Nobody, it was formidable enemy. The story is mixed with elements of surprise. I try to develop it so that the parts that you expect to go one way go another. We don’t come together and decide on the story from beginning to end. The staff helps flesh things out and I supervise myself making the final decisions. Since I’m the only one who can see the big picture and knows what happens after each development, I have a hard time figuring out how to draw it up for the staff. Though it’s an international series, it isn’t regulated for specific regions since I believe it will be well received if it’s interesting enough. Those at Disney said it has a very Japanese sense about it, I guess you could call it ‘Eastern thinking’. I thought that we’d make the storyline simple and clear, but I received this single piece of advice from Hironobu Sakaguchi: “If you don’t make it more complex like with Final Fantasy, you won’t be able to compete.” So from there the development moved to make something that would engage the colorful imaginations of the fans. 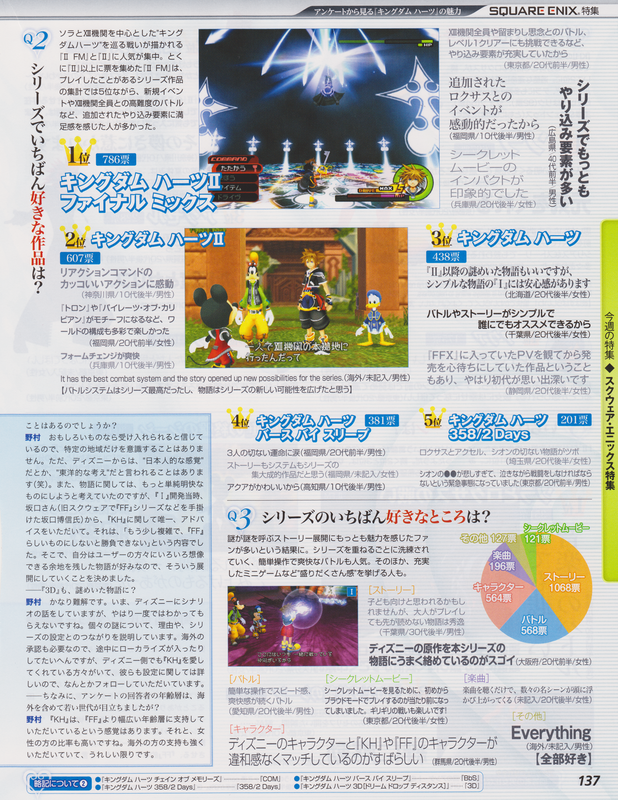 The storyline for KH3D is considerably difficult to understand. I am discussing it with Disney now, but they couldn’t understand it all at once. I’m explaining the reason and the established connections for each mystery one by one. It’s troublesome for the interpretation and localization, but there are many people in Disney who love the Kingdom Hearts series, somehow they’re following along with it. 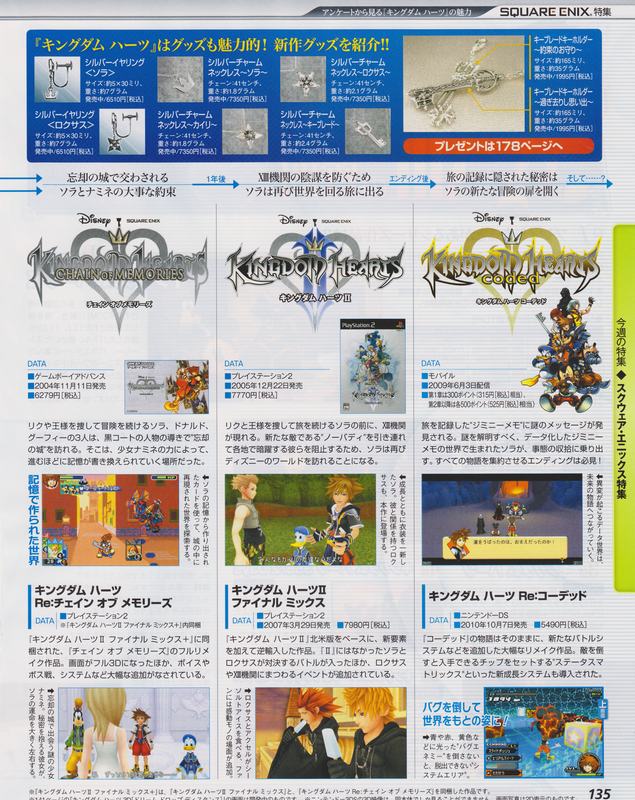 There’s a sense that Kingdom Hearts appeals to wider age range of fans compared to Final Fantasy. Ratio wise, more fans are female. I’m especially happy to see that there is strong support for the series from fans in foreign countries too. Since there are so many mysteries to wonder about that are unrelated to the main volume, we aren’t trying to explain all of them. 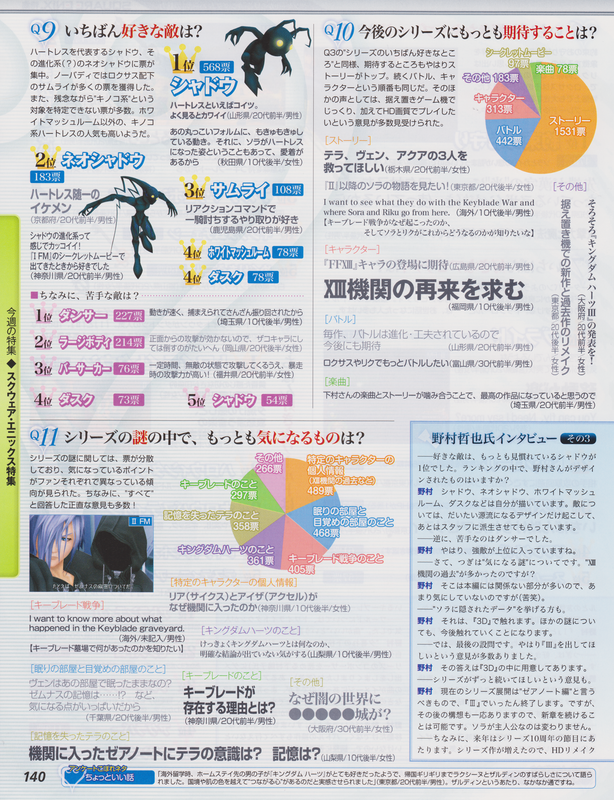 (Things like the personal information of the characters, the Room of Sleep, and the Room of Awakening.) 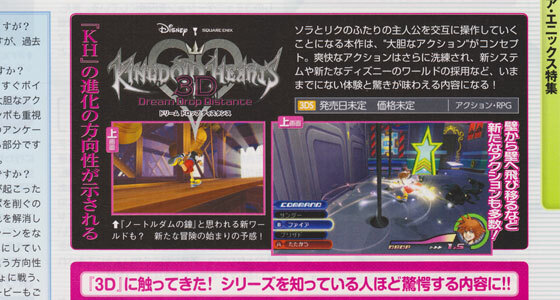 KH3D deals with Sora’s concealed data, I’ll reveal more about the other mysteries another time. 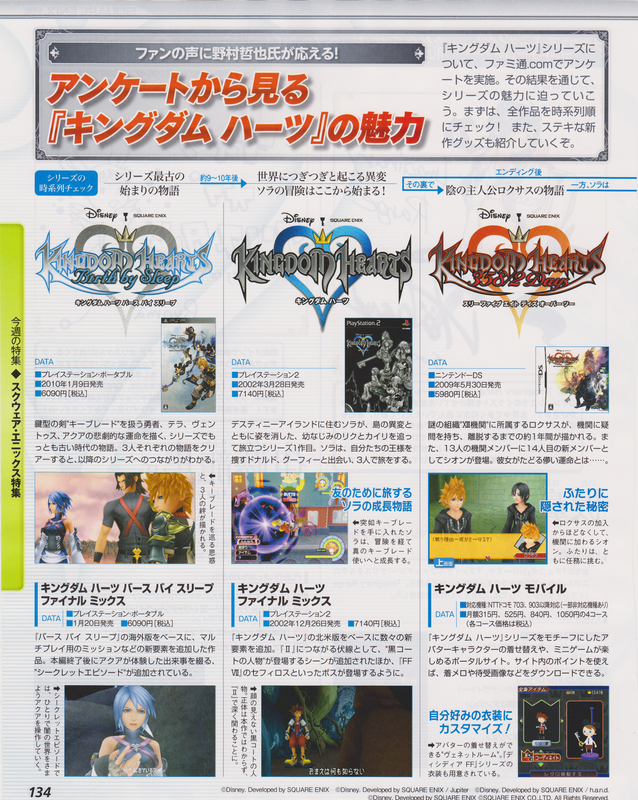 The development status of KH3D is about 40%-50%. We’ll start recording the voices soon. The theme this time was “bold action”, but we also wanted to stress the importance of the story’s tempo. Though the story is important to fans as shown by the results of the survey, it won’t be drawn-out. Not meaning that we’ve decreased the number of cutscenes, but having each one explained one by one reduces the tempo of the game, so we’re introducing a new system to make up for it. 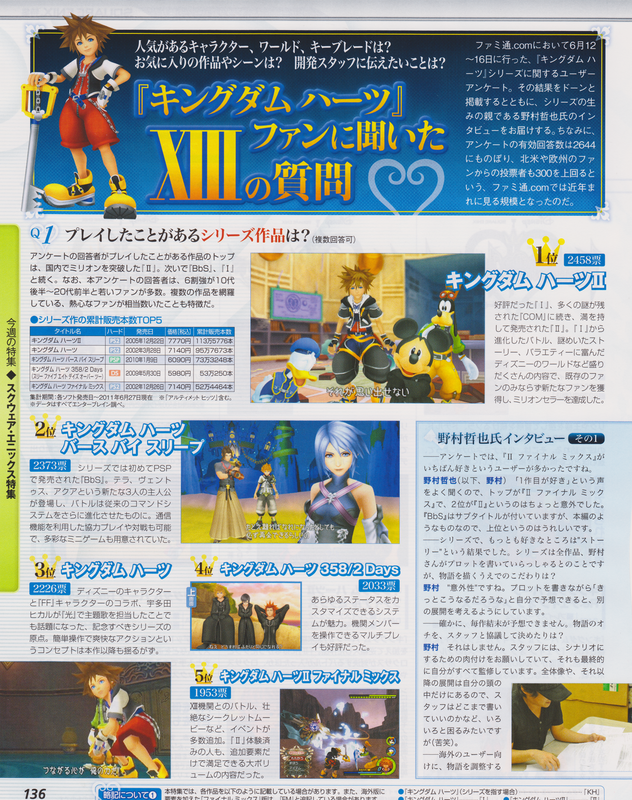 Again it’s directionally different from FF Versus 13. 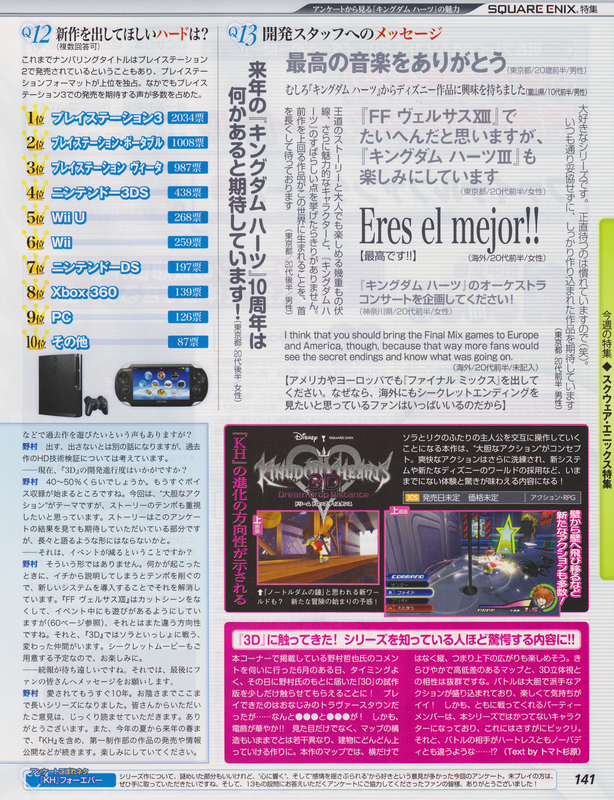 In KH3D, Sora will fight alongside various friends too. There’s also a secret movie being prepared. We’ve prepared a response in KH3D for the fans who are always saying, “We want KH3 to release!” The series that has developed so far as “the Xehanort saga” should end once and for all in KH3. I’ve outlined a tentative plot that takes place afterward, so we could continue onto a new chapter. Sora would remain the main character; that wouldn’t change. About an HD remastering, whether we release one or not is a different story, we have to think about the technical aspects of it. I’ll read everyone’s opinions carefully. From this summer to next spring, we’ll continue releasing information and sales dates for KH among other titles from the first development department, so please look forward to it.